The blog has been silent for a few days while I was in Ohio for a family wedding. As you may know, Kara grew up in suburban Detroit and considers Michigan her home state, but she was born in Columbus, Ohio. She still has many relatives there. New posts coming to the Hartfordite soon. Welcome back! I’m sure you all had a great time. 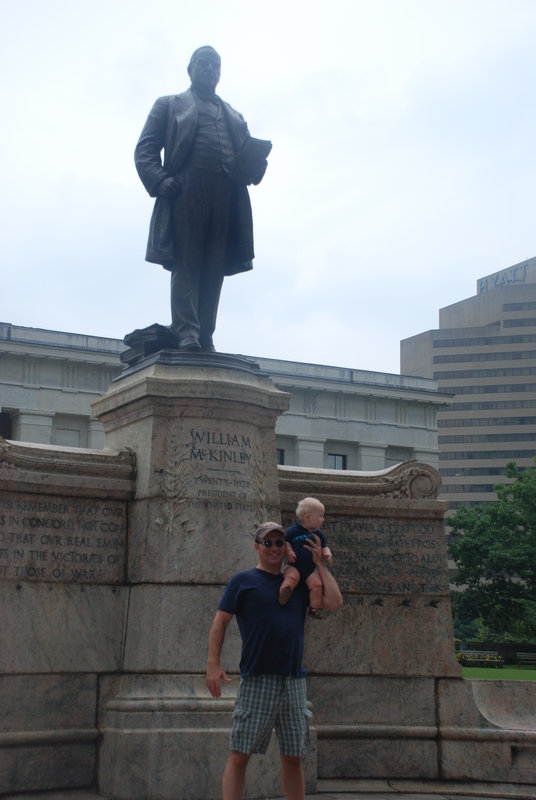 I love the picture of you and the baby in front of the statue! OK, I was wondering what happend to you, have not seen you on the news or here on your blogg. Nice picture of you and your child. I hope you that and your family are having a good time while out there in Ohio. I have never been out there, but do have a friend that lives there in Hamliton, Ohio. Mayor Scott Kauplin scottkaupin@cox.net said that he would be up to the challenge if I could put something together with you to have him come on Face the State and talk about all the stuff that has been going on in Enfield over the past few months. I don’t know if the schedule will permit for you to have him come on the show or not, or becuase it is local town news if it would fit into Face the State. The most recent is the high school graduation as to where to hold in. Just yesterday the board of Ed in Enfield decided to appeal the judges decission about holding the graduation in that Bloomfield Church. Let me know what you think and I enclosed his email address if you want to contact him directly.